The Grapes is probably the most famous pub on the planet, primarily due to the fact that the Beatles used to down a pint or two here between their gigs at the Cavern. In those days the Cavern was an alcohol free venue and you could only be served with the soft drink of your choice. 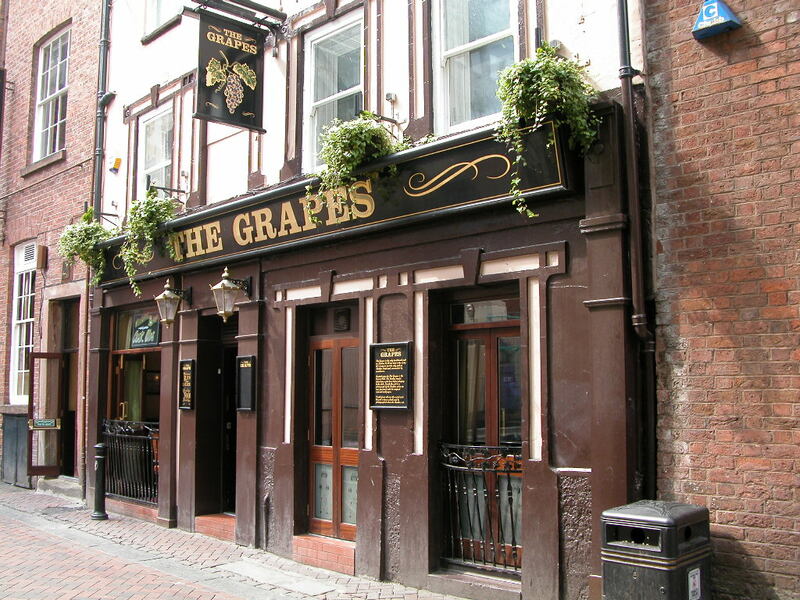 In those early days there was only one traditionall pub on Mathew Street and that was the Grapes. Those were the days when the local police used to enter the pubs and turf out any underage drinkers. The Cavern was basically a teenage scene with a scattering of older fans depending on who was playing at the time. The Beatles made the Cavern world wide famous and they performed there many hundreds of times during the early years of the sixties. The crowds were always huge on Mathew Street during any of their performances and it was the overflow of the crowd that filled the Grapes. Nowadays the Grapes has become a quasi shrine to the Beatles, not unlike the Cavern. The snug backroom of the Grapes is filled with memorabilia, photographs and the like. There is one particular photograph of the Beatles that was taken of them while they sipped a beer at the Grapes. The photograph is prominently displayed and shows the "four lads" sitting on a bench which still exists in the same location from the early days. Even the wallpaper shown in the picture remains preserved on the wall above where the Beatles once sat and is covered with a protective glass. The photograph is accompanied by a small plaque on the wall, above the fireplace, describing the event. Of course you can still sit on the same seats that the Beatles sat on and take a break, with a well prepared meal and glass of your favourite wine or beer.